Made in Perth, Western Australia, Australia, 2002. This card has significance as a record of music in youth culture around the turn of the 21st century. It helps to illustrate how printed graphic material was used to communicate information to a mass audience about rock music performers and specifically to promote concerts and CDs. Headshot were a Perth heavy metal band whose debut release ‘Rooms Within Rooms’ was released on the Sic Squared Records label. 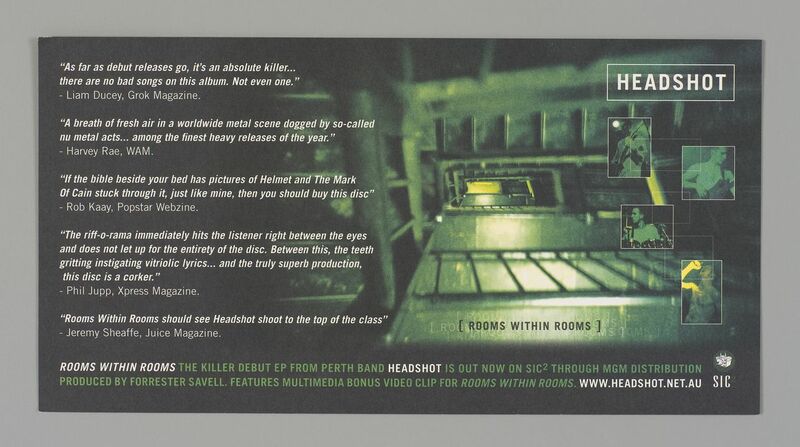 Rectangular card, printed on one side in green, black and white, with text and images promoting the heavy metal band Headshot. Designed by Redroom Design, Perth, Western Australia. Made for Headshot / Sic Squared Records.